One of the earliest signs of spring in my neck of the woods is the ardent chorus of spring peepers that rises from the pond behind my house. Some years those first peeps or the first calls of a wood frog come toward the end of February and some years it takes until mid-March for them to show up. They start to call and you know the cycle is about to kick in yet again. As children hear those sounds and wonder about them, they may begin to wonder what is going on in the pond. This book is the perfect guide to the wonder of toads in the wild. Using incredible photographs, every child can glimpse the strings of spaghetti-like eggs that will eventually metamorphose into the most wonderful of all pond creatures... tadpoles. Step by step we watch as the eggs progress through Day 9, Day 12, Day 20. When do the legs show up? How about arms? By Day 55, hardly bigger than a pea, the toadlet goes in search of a home. The whole miraculous process is celebrated through brilliant photographs that invite us into the wondrous world of nature and perhaps even give that all-important nudge that might send a child out to search her own pond to see what she can discover. A Glossary, Toad Facts, the Difference between a Frog and a Toad are all included as backmatter. 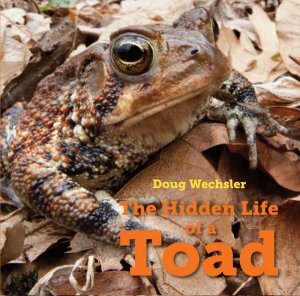 In jaw-dropping photos, Doug Wechsler captures the life cycle of the American toad from egg to tadpole to adult. To get these images, Wechsler sat in a pond wearing waders, went out night after night in search of toads, and cut his own glass to make a home aquarium. The resulting photos reveal metamorphosis in extreme close-up as readers have never seen it before.